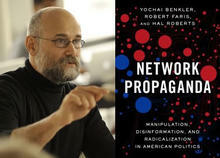 On Thursday, February 21st from noon to 1:30 p.m., the Policy Lab will be hosting a lunch talk with Yochai Benkler, a Professor at Harvard Law School, on his new book, Network Propaganda: Manipulation, Disinformation, and Radicalization in American Politics. “Networked Propaganda” combines data analysis and case studies to examine the right-wing media ecosystem and its role in polarization, the election of Donald Trump, and the rise of the current “post-truth” era. Analyzing millions of news stories together with Twitter and Facebook shares, broadcast television, and Youtube, Yochai’s book offers the most detailed analysis yet of contemporary American political communications. This event is open to the public, and lunch will be served. If you are interested in attending, please RSVP at the link provided.